Many people that struggle with hearing loss have their own varying reasons why they don’t want to wear hearing aids. Some people think they just don’t work, some people think all hearing aids are big ugly devices, and some people just aren’t ready mentally to start wearing hearing aids. Still, for some, the chore of learning how to use a new new device and incorporate it in to a daily routine just seems like an overwhelming burden. With all the marketing out there for hearing aids, wireless this, bluetooth that, remote controls here and smart phone controls there, it’s no wonder that some folks might think hearing aids are hard to use. The fact is, no hearing aids are simple to use. Even the largest hearing aids are relatively small devices, with small parts, small controls, and small batteries which need to changed every week or so. However, if you’ve got decent dexterity, hearing aids shouldn’t be “difficult” to use- at all. The fact is, for as advanced as today’s technology is, that doesn’t necessarily mean it is hard to use, and often times, it means they’re easier to use then ever before. So almost all hearing aids have user controls on them which will allow you to turn the volume up or down, and make other changes to the way your hearing aids sound- and these user controls and settings are configured by your hearing provider. However, your hearing aids don’t have to have these things. In fact, your hearing aids can be made with no controls on them at all if you want. Hearing aids can be almost as simple as eyeglasses if that’s what you desire. Put them on in the morning, take them off to shower, take them off to sleep. A minute ago I said that sometimes the advanced technology is even easier to use than basic technology, and this is true. For example, wouldn’t it be nice if when you walked in to a crowded restaurant, your hearing aids automatically reduced the background noise for you? Many entry level hearing aids won’t do this automatically, you’ll have to push a button on the device or on a remote control to make this happen. However, many advanced devices will do this automatically, and you won’t have to fiddle with any buttons at all for this to happen. That’s just one example of how advanced hearing aids can even be easier than the most basic hearing aids. There’s a few things you can never get away from when wearing hearing aids, and that is cleaning the hearing aid and changing the battery. With 99% of hearing aids you’ll have to open the battery door at night (to turn the hearing aid off), change the battery weekly, and clean the hearing aid daily or weekly depending on the device. If these things just can’t be done (or learned), there are a few other options that you may explore. 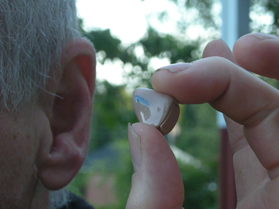 First of all, if you can swing it financially, the Lyric hearing aid is a great option. This is the easiest hearing aid to use because you have zero interaction with the hearing aid- no batteries to change, no cleaning, and no insertion and removal. If that’s not an option, you might also look at rechargeable hearing aids. These hearing aids will still need to be cleaned every so often, but at least you won’t have to change the batteries. Even though hearing aids have many small parts, they really aren’t that difficult to manage at all, and most people have friends, family, or caretakers that can help them with some of daily/weekly chores associated with having hearing aids. Out of the thousands of hearing aids I have fit, I’ve really only had a handful of people (less than 5), that couldn’t manage hearing aids after a few weeks of practice. If you think you’re going to have a hard time dealing with them, ask your hearing provider to consider that when ordering your device, as there are many things that can be done to make the hearing aids easier to use.